2 Lads Winery has an urban look and awesome views of the bay. TRAVERSE CITY, Mi. – South Africa has something going in Northern Michigan at Brys Estate Winery and Vineyard. Coenraad Stassen, a native South African, is the winemaker at Brys. The whites and reds were very well made wines with great focus and balance. The visit featured one of the best Chardonnays I’ve tasted here and a great blend of Cab Franc, Merlot, and Pinot – odd I know, but wonderful wine. I spent today on the Old Mission Peninsula which is that small strip of land at the center of Traverse Bay. The day started with a drive out to the Old Mission Lighthouse, a small but historically significant spot that guided ships through the Great Lakes. First wine stop was a second-time visit to 2 Lads Winery. The winery is surround by rolling hills and a spectacular view of the east bay. The wines are really nice with a great Rose’ of Cab Franc, the winery’s signature Cab Franc bottling, and another really nice 100 percent Merlot. 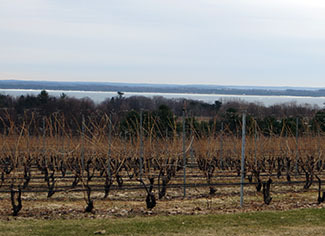 No one makes the trip up the peninsula without a visit to Chateau Grand Traverse. One of the area’s oldest and biggest winery has a big lineup of wines but still brings new bottles to the table. I remembered the CGT Gamay Noir from my last visit and enjoyed tasting that wine again. Just imagine a Gamay with a little more freshness and a tad less fun – Gamay Noir. Not yr typical meatbals and pasta. Good stuff! Then it was back into Traverse City and out to the old insane asylum now known as Traverse City Commons. 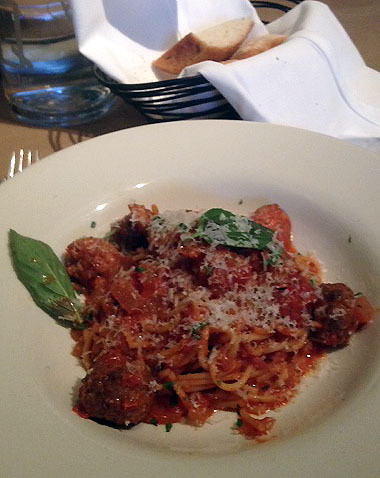 I had a great lunch at Trattoria Stella and even a little gelato for dessert. Then it was over to one of Michigan’s most honored wineries, Left Foot Charley. If you likes whites and like Riesling, you’d love Left Foot Charley. The Riesling ranges from bone dry to quite sweet, but surprisingly balanced, white. I was disappointed the latest Pinot Blanc had not yet been released and previous vintage was sold out. The dry Pinot Blanc is the calling card for LFC and called by many one of the best bottles of wine to come out of Michigan. Tonight my Michigan trip ends where it began over in Leland on the Lake Michigan shore. Leelanau’s Northern Wine Loop producers will offer tastes of their 2013 vintages paired with food from the small village’s famous Bluebird restaurant. It’s an annual big social event.